Parking for the weekend of the wedding should be easy to obtain, however, parking in the Loop can be a bit expensive, so we would like to save you some time and money during your visit. If you are staying in a hotel, please know that most places in the Loop will charge you $50 to $70 to park your car per night. A GREAT way to save a ton of money on parking is to pre-book a spot in a nearby garage using a parking app. 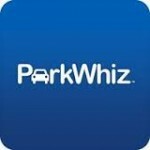 You can do so using the websites below and if you click the images below you can save $10 with your first reservation by using ParkWhiz. 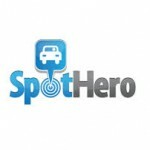 If you use SpotHero you can save $5. Both have very convenient smart phone apps you can download or you can use their website interface and print your parking slip. For instance, the lot called ‘321 S. Wacker Lot’ is typically $12 for 24hrs Saturday to Sunday on ParkWhiz, this lot is right next door to our reception venue and within walking distance to both the W Hotel and the Old St. Patricks Church. Lot 1: There is no charge to park your car in the parking lot at the Southeast corner of Adams and Des Plaines. Lot 2: There is no charge to park your car in the roped off area marked “Old St. Pat’s” in the parking lot at the Southeast corner of Monroe and Des Plaines. PARKING IS NOT PERMITTED IN THE EAST SECTION OF LOT 2.